Caveman Combo Heritage Meat Kit for sale. Buy online at Zingerman's Mail Order. Gourmet Gifts. Food Gifts. Over and over, whenever I get to taste a food that is made traditionally, when beforehand I’ve only had its commercial counterpart, I’m stunned. It’s been true for bread, cheese, salt (yeah, salt) and dozens of other foods. The past year my mind has been blown by fresh meat. In particular, the pork and beef we’re getting from heritage breed animals raised outdoors, raised to root and roam, raised without hormones and antibiotics. In other words, raised the way every animal was raised in America until sometime in the 20th Century, when the switch flipped and what was normal is now an anomaly. Less than 1% of our country’s meat has a pedigree like this. After tasting meat from many different farms and sources, I can tell you they all don’t taste great, either—sometimes you pay for the animal husbandry but don’t get the flavor. We've done that work for you (I know, tough job, right). What we have here are some extremely tasty fixings. 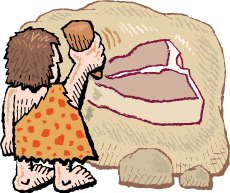 When Fred Flintstone got that cut of dinosaur that toppled his car it was a comic nod to real cuts of meat like these. Huge versions of the chops and steaks we’re used to, cut thicker, with more bone, more fat, more meat, more everything: two thick porterhouse pork chops, a gigantic grass-fed cowboy cut ribeye steak, and a pound of ground beef, all shipped frozen anywhere in America for a night—or a week—of grilling you’ll never forget. Dry-Aged Cowboy Cut Ribeye and Heritage Pork Spare Ribs.